Yeah. That's snow. I escaped the freezing cold of my mother's house and found safe harbor at a local Starbucks. That's not what this post is about, though! It's about Board Stiff! You can finish reading all about the Dark Overlord's disappointment over at GamesAreEvil, where I take a look at Aye, Dark Overlord. Second thing – I realized looking back that I didn't post two of my Board Stiff reviews from March. Seasons and A Few Acres of Snow are two of my favorite games right now, and they both bring some unique features to the table. Both use selective card drafting, or deck building, and both are games where you're battling against your opponent(s). In Seasons, you're a wizard casting magical items and familiar to best your enemies. 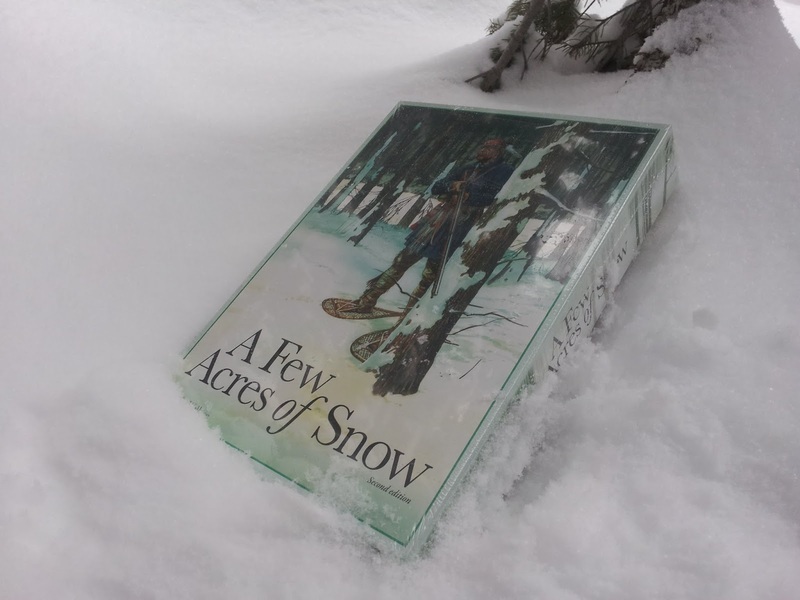 In A Few Acres of Snow, you take on the role of the French or the British in the American theater of the Seven Years War. I recommend both completely, so head over and take a look at Seasons and A Few Acres of Snow.